The other day, quite unintentionally actually, I found myself in Chapel at my school, Pittsburgh Theological Seminary. I am a marvelously busy guy these days, and Chapel is one thing that just seems to fall off my radar screen each week. But I was having lunch with someone who wanted to swing by Chapel first, so swing by I did. It was amazing! I had like a half hour to sit and pray and worship without being rushed from one thing to the next. It made me wonder why I don’t do it more, and the obvious answer is that I haven’t made it a discipline or habit (more on this later). It was more than a little bit powerful to reflect on that. I will confess, particularly in a busy political season, I am apt to put blame for a whole host of problems on someone else’s shoulders. If this person believed the way I do, then we’d all be fine. If you saw the world the way that I do, things would be different. If I didn’t have to be at this school 5 days a week, I’d have time to, you know, enjoy my family. So frequently, the blame goes elsewhere. But as I made my way back to my seat in the chapel, I was kind of struck by the weight of Christ’s blood on my hands. It was my sin that put him on the cross. It was my failure that he had to take care of to restore me. It is him who keeps nudging me toward transformation every day, because I so desperately need to be transformed. None of this is “woe is me” language either. If anything, I was profoundly grateful for everything Christ has done and continues to do in me. I am grateful for a moment to have taken the blame off of other people and placed it on myself, only to find in that moment pure and unadulterated forgiveness in the person of Christ. I hope you have occasion for that sometime soon. 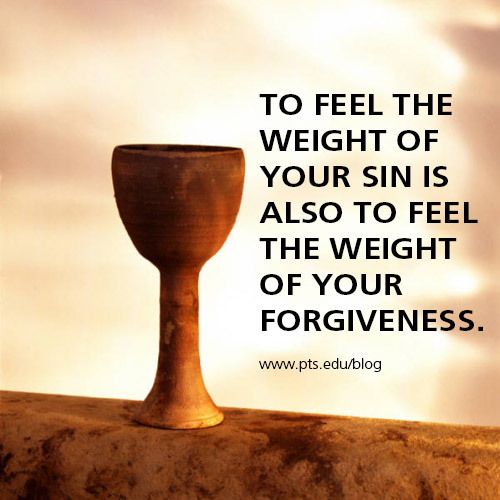 To feel the weight of your sin is also to feel the weight of your forgiveness. It’s why we have a confession of sin in our worship services. To feel the weight his blood on our hands is also to feel the weight of his love and mercy. May we all know this grace this week! Jason Freyer is a senior MDiv program student at Pittsburgh Seminary. This content originally appeared on his blog Jan. 15, 2016, at http://www.jasonfreyer.com/j-blog/. “Take and eat,” Jesus said, passing the bread around. And everybody did, except for Philip, who went away hungry, for he was allergic to gluten. Oh, wait, that’s not how the story goes! There is no evidence to suggest that any of the disciples suffered from a wheat allergy, but lots of Christians do today. And that makes it challenging to come up with communion elements that everyone in a given Christian community can enjoy together. Yes, there are other ways you can handle the issue.You can of course have a little plate of gluten-free wafers on the side for those who need them. But somehow it just doesn’t match the extravagant spirit of the meal itself—those forlorn little wafers for the complicated ones in the shadow of the big crusty loaf blessed and broken for everyone else. Those of us who support the PTS chapel program have been on the quest for a common loaf for a couple of years now. We have tried many a gluten-free loaf, looking for that perfect combination of breakability and taste. There have been some real disasters over these months: There was the loaf that was, yes, gluten-free, but exploded into a fine crumbly powder when broken, with each worshipper leaving behind a trail of bread crumbs that would make Hansel and Gretel proud. There was the one that didn’t show its true colors until a hunk of it was dipped into the cup of wine, at which point it promptly dissolved. What are you supposed to do as you watch your piece of bread sink beneath the waves never to be heard from again? The body of Christ, sunken for you? All you could do was choke out a mournful “Amen” and head back to your seat. Finally there was the one that worked beautifully for the gluten-intolerant members of our community, but it did so by adding ingredients from the nightshade family, thus rendering it off limits for another member of our community! Back to the big crusty loaf and the lonely wafers. The turning point came a couple of months ago, when PTS M.Div. 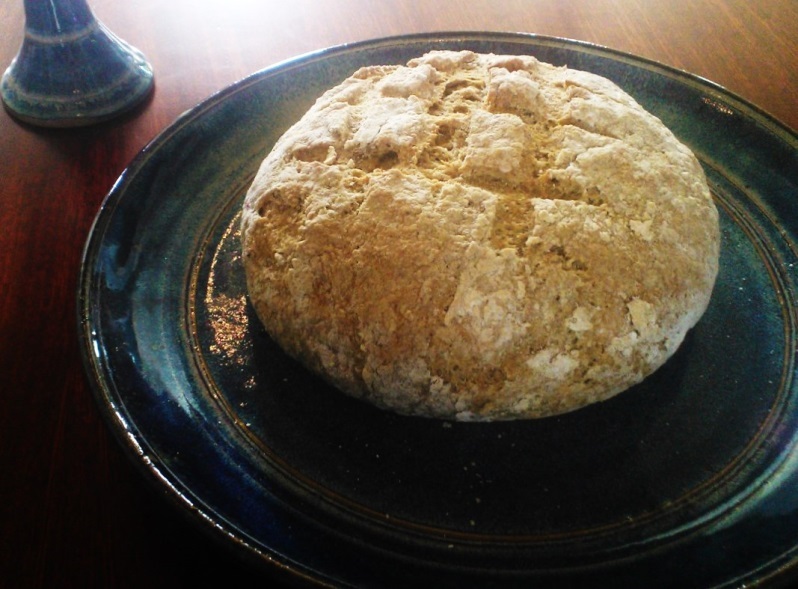 senior Charissa Howe found a recipe for gluten-free, nightshade-free, nut-free, vegan bread and did some tweaking. The final version calls for some uncommon ingredients: chia seeds, maple syrup, psyllium husks, and garbanzo flour, to name a few. It does not explode, crumble, or dissolve into the cup, and it has a wonderful taste and texture. 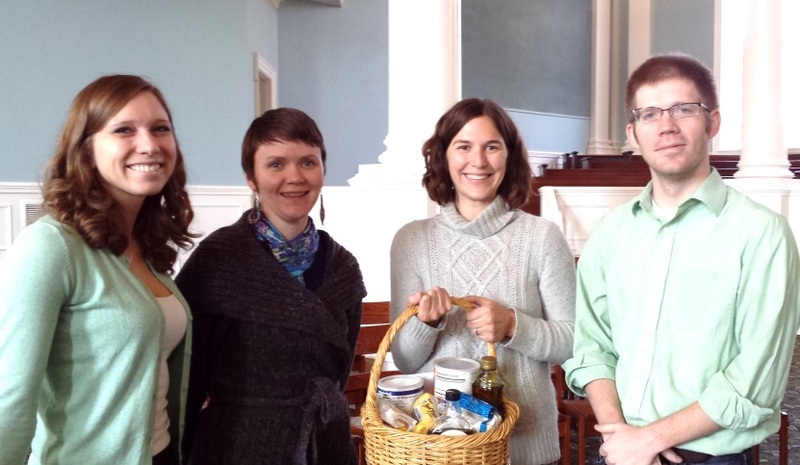 Four people from the PTS community have graciously been baking this new bread for our Thursday chapel service each week, passing the basket of unusual ingredients around: Kendra Smith, Charissa Howe, Shana Hutchings, and Greg Steible. We also have some new volunteers who will soon join the rotation, but we can always use some more! If you are interested in baking bread for chapel, contact our chapel coordinator Greg Steible (gsteible@pts.edu). So next time you come to chapel on a Thursday, take a good look at that uncommon, common loaf there on the table. Kind of a parable, don’t you think? 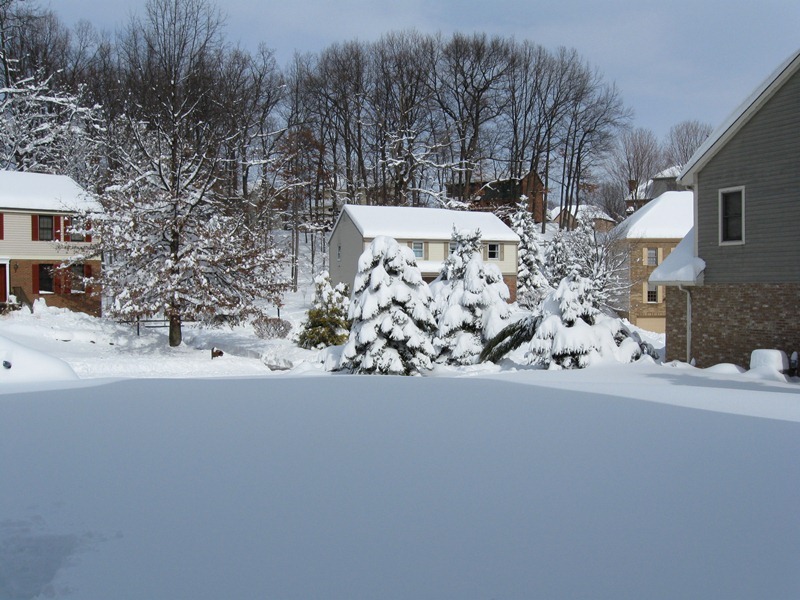 This has, thankfully, been a mild winter in Pittsburgh (the picture above comes from 2010). Still, this year as every year, Lent began while winter still held sway. Indeed, even now, with February at long last over and done (how strange that, according to the calendar, February is the shortest month of the year! ), the official first day of spring, March 20, seems a long way off. All of which may seem appropriate. Lent certainly seems a wintry season of the church year: dark, cold, grim, unforgiving. The liturgical color for Lent is purple—an appropriately dark and lugubrious shade. But we are likely to think of Lent even more in winter shades: the penitential black of clerical garb, the gray of Ash Wednesday’s daubs on hands or foreheads, the off-white of sackcloth. Yet, curiously, the term “Lent” has nothing to do with winter, or darkness, or fasting, or penitence. Etymologically, “Lent” derives from the Middle English lenten and the Old English lencten, and is related to the Old High German lenzin, all of which mean “Spring”! Likely we will have difficulty wrapping our heads around this concept. Lent as springtime? Our springtime associations wrap about Easter (a name which, by the way, derives from the Saxon goddess of fertility and the dawn! )—the feast of Christ’s resurrection, acclaimed by John of Damascus (sixth century) as “the Spring of souls.” Even in the secular world, Easter is celebrated with signs and symbols of newness and life: eggs, brightly dyed in the shades of spring flowers; bunnies (famous for their fecundity! ); and new clothes. By contrast, these 40 days of preparation are appropriately penitential, marked by self-examination, prayer and fasting. Likely, we would prefer to skip the preparation and jump directly into the celebration! But the Lenten disciplines are not optional. Mark reminds us that, after Jesus’ baptism, “the Spirit immediately drove him out into the wilderness” (Mark 1:12). Jesus could not avoid this time of trial, and neither can we. But this Lenten season need not be grim and colorless. Lent is a green season—a time of growth. Lent provides the opportunity for us to dig down deeper in our tradition, to break up the fallow ground of our cold hearts so that the Water of Life may seep down into the center of who are. Lent is the time for the Spirit to prune away our dead branches so that we may bear fruit. 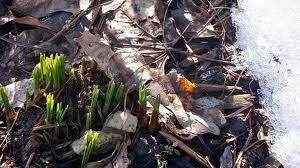 It is then a season of new life—a springtime for our souls! God grant you, sisters and brothers, a green, growing, God-filled Lent!